today i come to you as 3 of a kind because i had so many pretty ideas for Violent Seductions Vixen Set for the Kawaii Project. Origami is still going on untill the 5th of April where you can find the pretty Sakura Heels from Sweet Things since they are not rigged i could make them fit with JDs Penny Stockings. Have fun on all the pretty events that are going on right now. i hope you all had such a great weekend like i had. It’s a new week and i have a bunch of news for all of you. 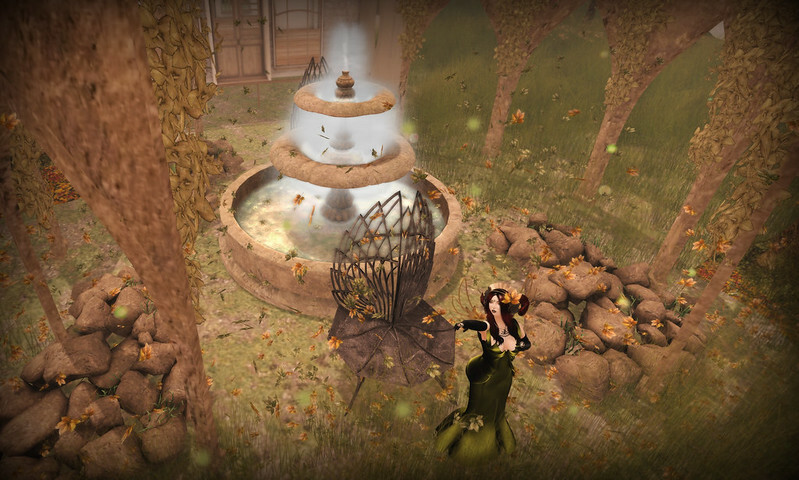 Mystic Realms Faire (10th -26th October) finally opened the doors so you can get this pretty fountain and arcs made by Kalopsia there. This pretty Bindi an Septumpircing is from Pekka for the Body Modification Expo (10th-31st of October). My georgous skin is Sia from Glam Affair and can be found together with this necklace and ring at Collabor88. Also i want to say if you like my poses i finally upped some of them to the marketplace like this one i made to give you the best view on this pretty ring from Glam Affair. Keep on reading for the credits and to get a closer look at this pretty ring and face. today i have a bit fantasy styled outfit for you with bits from the upcoming Mystic Realms Fair which (10th – 26th October), a bunch of stuff from the new Suicide Dollz round and a new face from Glam Affair for the October round of Collabor88 that just started today. Sia comes in 4 different tones (arctic, america, jamaica & the fantasy tone pearl i wear for this shoot) and with 8 different make ups. So i wish you much fun on your shopping spree.